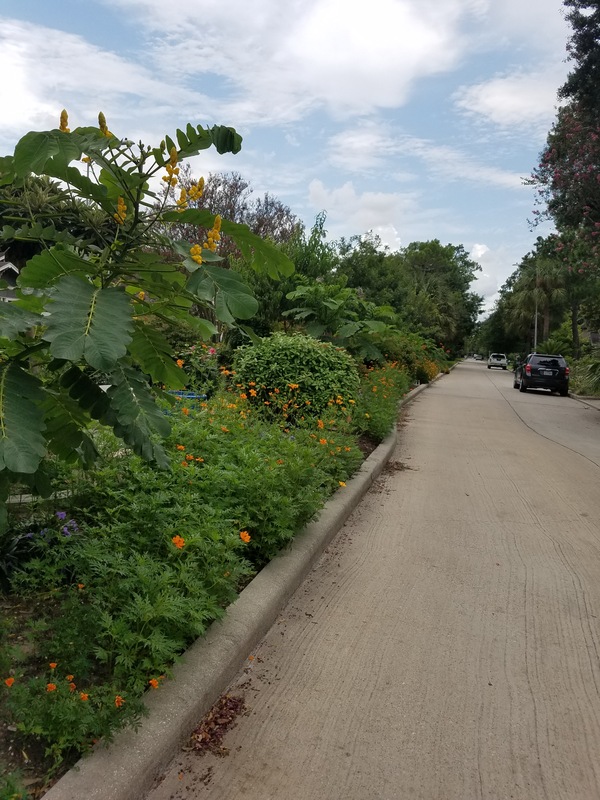 Yesterday we happened upon this beautiful median on a residential street in Montrose. It was so unexpected. What caught my eye was this lush plant. I could not remember the name…C…something. I have seen it growing around Houston for years. I know it dies back in a freeze and knew I would look up more on it when I got home. We noticed an older gentleman weeding so I walked over to ask the name. He said its a Candlestick tree. Then he asked if I would like one 😊 Of course but I have a meeting can I get it after? We talked to the client about the beautiful media and they told us he does it all himself. What a wonderful gift to the neighborhood! After the meeting I went back out to find the Gardener. He was still there in the garden and said he had done enough weeding. And we chatted about the plants. He told me yes he planted all of them, getting them on sale here and there. He is 75 and has a slight accent, German perhaps. I rarely talk to strangers but he was very calm. I think people that dig in the dirt are the best! I asked how the long strip is watered and he told me by hand. Takes four long hose connected and about an hour. I am so impressed. And you know these bushes where buzzing with bees. This is a real pollinator cafe! He said sometimes he rips things out and plants new or moves things around. A real gardener! He had little pots in the ground and pulled one out for me to take home. I love the leaves! I have come to recognize the structure as most likely in pea family, Fabaceae (Leguminosae). Commonly known as the legume, pea, or bean family, are a large family of flowering plants, like Bluebonnets. The botanical name for this plant is either Senna alata, Cassia alata. It has several common names such as; Empress candle plant, Candle Bush, Carrion Crow Bush, Candlesticks. It is originally from South America. It can grow up 6-8 feet in just a few months. It will die back in a hard freeze but is generally hardy in our area either from the roots or reseeding. Here is a new leaf on my plant about to unfold. These plants are very showy and are considered a shrub or small tree with yellow candle-like flowers that can reach 18 inches high. They prefer sunny open areas. Interestingly they also have medicinal uses as an antibacterial and anti-fungal. The flowers have been used for treating ringworm infections for a long time. I want to see that median! That is so cool. Kudos to the enterprising gentleman for his hard work. You remind me, I have a Cassia alata that came up in an odd spot in the back garden. I need to soak it and then dig it so I can plant it in a more felicitous location. Lovely story! I wish he lived in my neighborhood. The plant reminds me of Cassia didymobotrya, aka popcorn Cassia. I grew one a few years ago and the leaves really do smell like popcorn. Thank you! It was the highlight of my day. I need to look up that variety. I will probably grow here. What a great story! Any community would be happy to have that man as a neighbour. 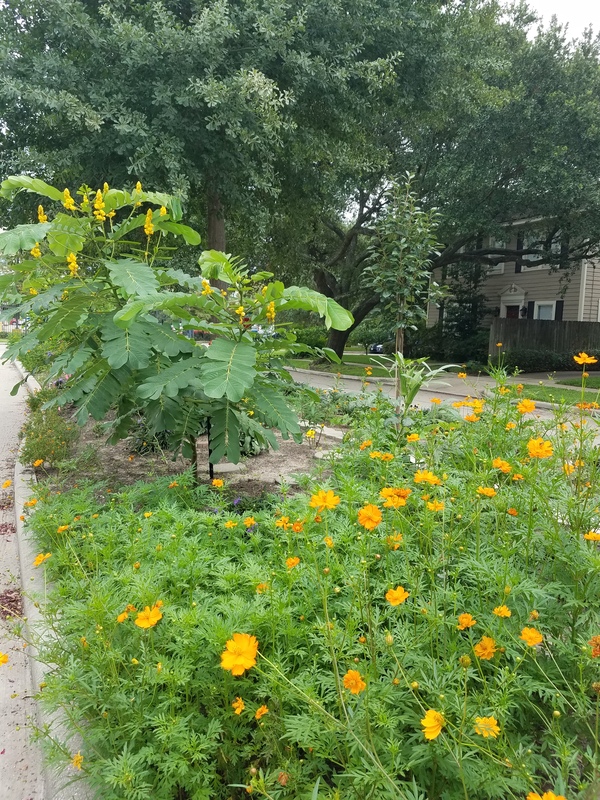 I love that I see a trend here in Houston of gardening in the medians and right of way strips. It pays to talk to gardeners, doesn’t it? What a lovely gift to the neighborhood, and how nice of him to share it with you. It sure does! They are very sharing people! How wonderful that he has time to take care of the median. Did you ask about his own garden? Oh my that would have been a good question. I plan to go back when I have plants left over from jobs to donate to him. I will remember to ask. Beautiful Laurin!! Can you share the location? I would love to go see it! You and Shawn have brought out the hidden gardener in me! I can’t get enough! That is a dedicated gardener! 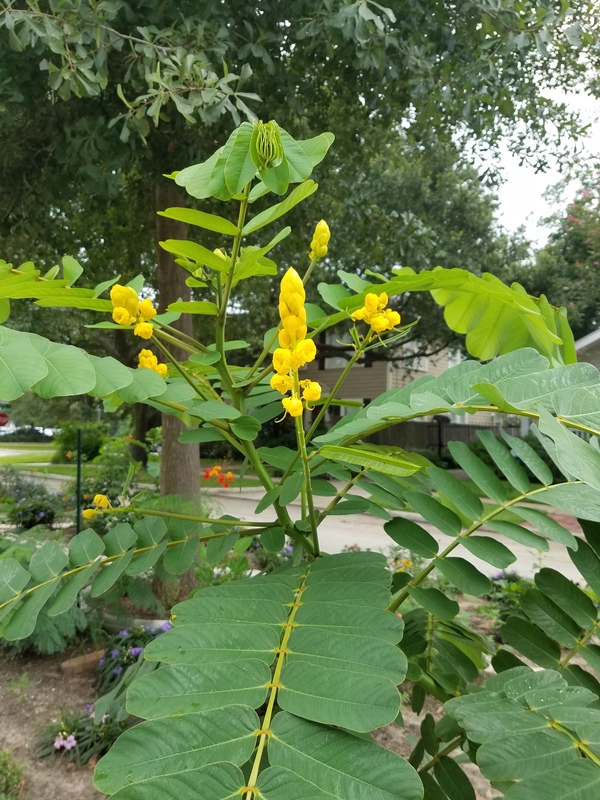 And such a fabulous plant – we have a Midwestern version, Senna hebecarpa. I just planted one this spring! Wishing you all the best right now.